The below image was originally on the late Barbara Irwin’s web pages on Liberal, which are no longer maintained. 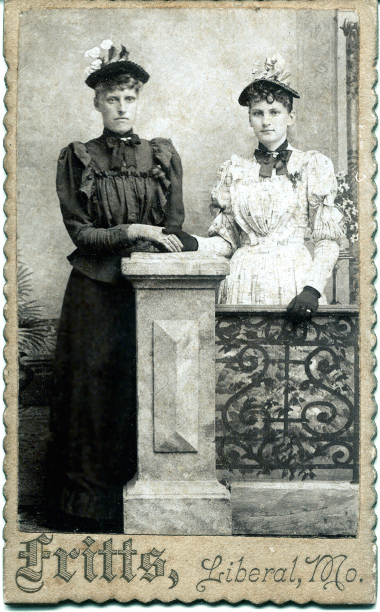 It was submitted to her by a Mary Jane Conrades who was seeking information on the women in the photo and stated the Missouri Historical Society Archives had dated the photo is being in the 1880s. 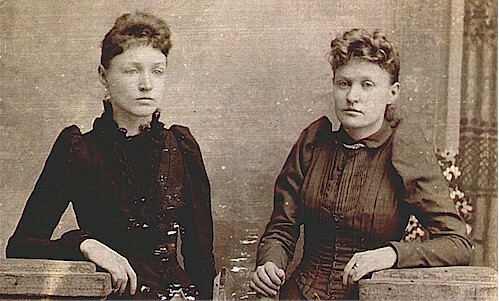 Showing similar hairstyles of bangs and curls, I’ve a family photo which shows the same backdrop at Fritts, and would be from the same period. To learn more about the above photo and the individuals in it visit this page. I find Joseph and Phebe B., ages 77 and 70, from New York, on the 1910 census in Liberal but not the 1900 census. In 1910 they aren’t listed as being in photography. They were in Macedon, Wayne county, New York in 1880 (little Phoebe was 6 years of age so she was 13 when she died), but Joseph was given as a farmer and gardener, not a photographer. So, we know Joseph Fritts and his wife were early residents of Liberal, who would have been attracted to the area during Walser’s freethought period, but we don’t know if he owned the studio. Joseph is the only Fritts in Liberal in 1910, and there are no Fritts families there in 1900, Joseph and Phoebe were then living in Drywood, Bourbon, Kansas, and Joseph was again listed as a gardener. If they did run a Fritts studio and it was still in Liberal as late as 1909, they may have sold it by that time. Or perhaps they had nothing at all to do with the Fritts photo studio. Hello, I hope you don’t mind my putting my two cents in. I always appreciate it when I get feed back from people visiting my site. At least you know someone is reading. I can tell you that the first photo on this page were taken in late 1890s or early 1900 at the peak of their popularity by the sleeves both lady’s are wearing. 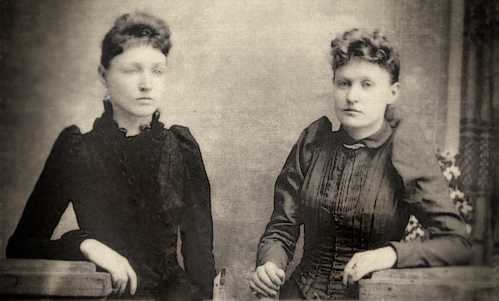 Prior to 1898 this sleeves won’t be found, at least in photographs dating back to 1840. The hairstyles can be later but the sleeves can’t be mistaken. What qualities me is that I help people tell the possible dates of their photos in order to identify people in their family tree by studing fashions from 1840 to about 1960 and I have been restoring photographs since 1996 which exposes me to photos with known dates. I hope this is helpful to someone.